More than 300 delegates who work with young people in parishes, schools, communities, universities and vocations are expected to attend the Australian Catholic Youth Ministry Convention (ACYMC). As the peak formation and networking event for Catholic youth ministry and evangelisation in Australia, delegates will explore Pope Francis’ and the Australian bishops’ focus on young people and their inclusion and support in the life of the Church. The ACYMC follows the hugely successful Australian Catholic Youth Festival (ACYF) in December 2017, where more than 20,000 young people celebrated their life in the Church. The convention builds upon the ACYF and the current Year of Youth to offer training and support for local ministry across Australia. Malcolm Hart, director of the Australian Catholic Bishops Conference’s Office for Youth, said the long-term impact of these events was the local engagement and formation of programs in communities across Australia. “The convention is focused on supporting the important local work in parishes, classrooms and communities, which forms the foundation of faith to so many young people,” Mr Hart said. 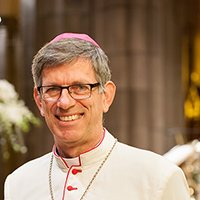 Bishop Mark Edwards OMI, a member of the Bishops Commission for Family, Youth and Life and Auxiliary Bishop of Melbourne, will be a keynote speaker at the ACYMC. Soon after the convention, Bishop Edwards will travel to Rome to participate in the General Synod on Young People, Faith and Vocational Discernment. He and Sydney Archbishop Anthony Fisher OP are the two Australian bishops attending that Synod. “The ACYMC will provide a powerful platform for our growth as ministers and help us and our groups to respond to the General Synod on Young People, Faith and Vocational Discernment and prepare for the Plenary Council 2020,” Bishop Edwards said. The event will be held on September 21-23 in the Diocese of Parramatta. Registrations close on August 24.